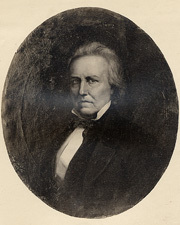 MERIWETHER, David, a Senator from Kentucky; born in Louisa County, Va., October 30, 1800; moved with his parents to Jefferson County, Ky., in 1803; attended the common schools; engaged in fur trading in 1818 near what is now Council Bluffs, Iowa; later engaged in agricultural pursuits in Jefferson County, Ky.; studied law; admitted to the bar and commenced practice; member, State house of representatives 1832-1845; unsuccessful candidate for election in 1846 to the Thirtieth Congress; delegate to the State constitutional convention in 1849; secretary of State of Kentucky 1851; appointed as a Democrat to the United States Senate to fill the vacancy caused by the death of Henry Clay and served from July 6, to August 31, 1852, when a successor was elected; was not a candidate for renomination in 1852; appointed by President Franklin Pierce as Governor of the Territory of New Mexico 1853-1857; member, Kentucky house of representatives 1858-1885, and served as speaker in 1859; retired to his plantation near Louisville, Ky., where he died April 4, 1893; interment in Cave Hill Cemetery. Meriwether, David. My Life in the Mountains and on the Plains. Edited by Robert A. Griffen. Norman: University of Oklahoma Press, 1965.